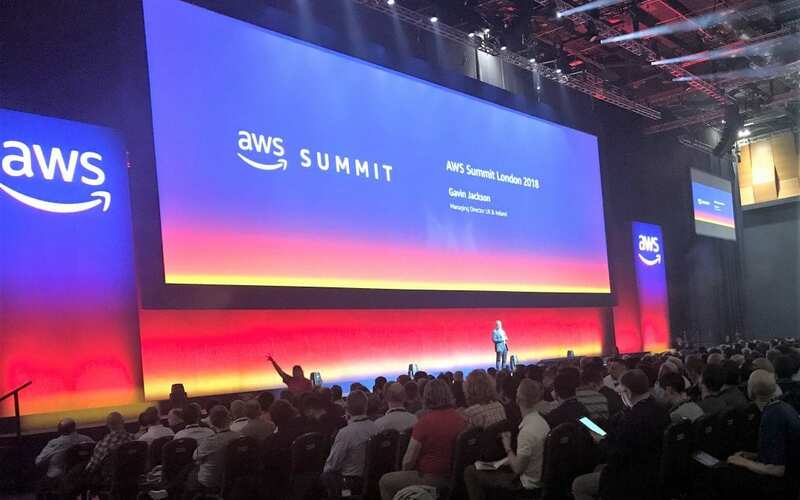 If you weren’t one of the 12,000 attendees or one of the 4,000+ streaming the AWS Summit, London live then let me take 2 minutes of your time to fill you in. Firstly, wow, the number of attendee’s year on year is increasing and I have to say there was no sign of the much need autoscaling in the sign in and queuing processes. As Gavin Jackson (UK MD) highlighted in his opening gambit the speed of growth in AWS revenues is not only growing but it’s gathering pace. Gavin called out the $22bn revenue run rate and 49% yoy growth figures to demonstrate that AWS is growing faster than any other IT company, ever. What does AWS put this monumental growth down to? A mixture of digital transformation or as they put it Industry = Software and the growth of new start-ups and apps choosing AWS over other “high calorie technologies”. After an interesting case study from Jaguar Land Rover on connected cars, CTO Werner Vogels took to the stage for the main keynote. The main kick off topic was around data and the discussion that as all companies are now working on the level playing field of having access to the same AWS services, organisations have to differentiate through using their data, innovating and improving customer outcomes. 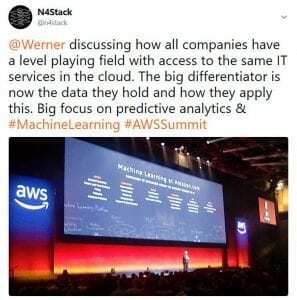 Data is therefore a huge focus for AWS as it indeed it is with Azure as the hyperscaler’s are investing heavily in Machine Learning and AI to provide the game changing secret sauce for new applications. Having met with Microsoft’s UK CTO Michael Wignall a couple of weeks ago he explained that Microsoft has over 5,000 staff dedicated to AI and ML R&D…. this is the new battle ground. As Werner put it “We matured our IaaS service in 2009/2010”…. Iaas is so last decade!. After the run through of containers and serverless…. 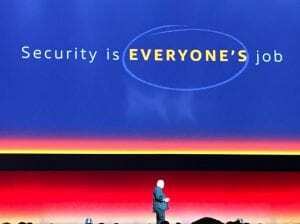 (with Werner gleefully pointing out the complete lack of serverless capability in Oracles cloud), the keynote finished poignantly on Security, obviously every presentation needs a mention of GDPR! but the closing message was “Security is everyone’s responsibility” with an almost fatherly tone pointing out to all the eager (now nervously twitching) Devs in the room the finer detail of AWS security capability that needs baking in as standard and not to leave it to the responsibility of the security team. After the keynote there were some great sessions all focussed on technical “how to build on AWS” and none of the normal corporate guff delivered by commercial staff with no real technology grasp.